Welcome to this month’s Blogorail Teal loop. Today we are sharing Disney copycat recipes you can make at home. 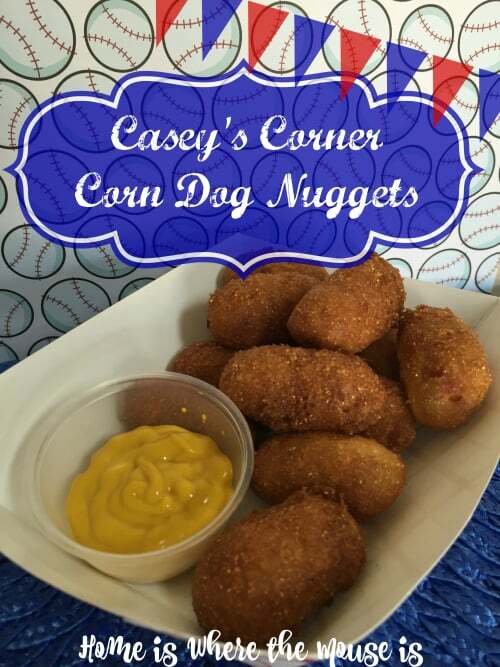 Corn Dog Nuggets from Casey’s Corner are one of our favorite Magic Kingdom snacks. But why wait for your next vacation to try them? 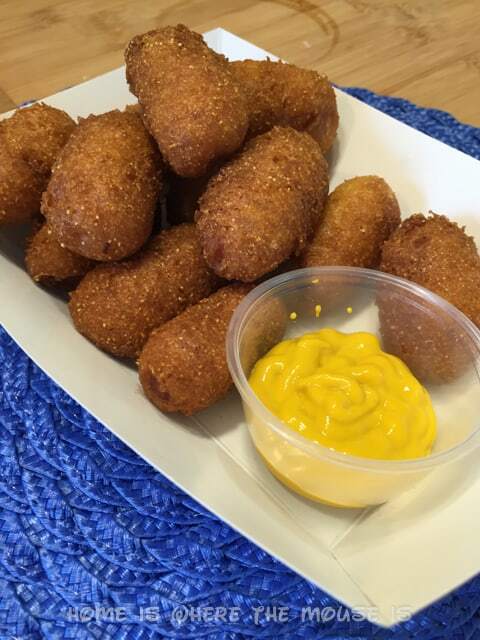 You can easily whip up a batch of these golden hot dog filled nuggets in no time! 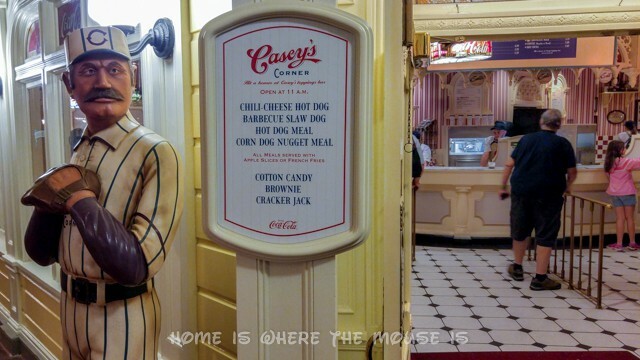 You can visit Casey’s Corner on Main Street in the Magic Kingdom. 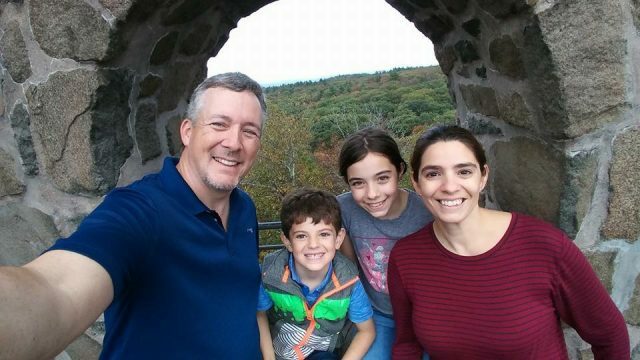 Themed after the beloved poem “Casey at the Bat”, this quick service restaurant is our family’s go-to place (and not to mention, James’ favorite). Not only do we love the food, but the nostalgic memorabilia that adorns the walls, takes us back to a simpler era. The best time to go is when live piano music is being played outside. You’ll easily get transported back to the good ol’ days with some toe-tappin’ tunes. The fare at Casey’s Corner is that of your typical hot dog stand. Up until recently, their famous Corn Dog Nuggets were only available as a snack. But now you can purchase them as a meal served with your choice of either fries or apple slices. You get 10 golden fried nuggets in each meal, suitable for sharing or keeping all to yourself. It was surprisingly easy to recreate this family favorite at home. In an effort to make this more of a weeknight meal than a special occasion meal I do admit I took a short cut. Instead of making the corn muffin batter from scratch, I used a box mix. That cut down a lot of time and gave the kids an opportunity to help. Before you start the process, make sure the hot dogs are dry. I inserted a toothpick into each one to make them easier to dip. Dredge the hot dogs in flour before dipping them in the batter. I learned the hard way that if you don’t, the batter will fall off during the frying process. You’ll end up with a pot full of corn muffin crumbs. Step 2: Fry ’em up! I found that if I plopped them in, they would fall to the bottom and stick. Instead, I worked slowly, only dipping and dropping one hot dog at a time. Soon, I came up with a pretty good system. I held them by the stick in the oil for 10 seconds before dropping them. This gave the muffin mix time to set. 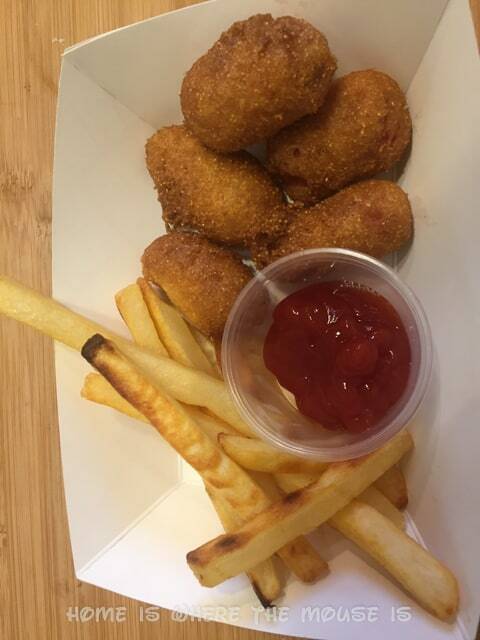 The corn dogs could then float on top of the oil and not sink to the bottom. While the hot dogs are taking their oil bath, roll them every once in a while to make sure all sides get nice and golden brown. Mine did not want to stay in one place so I eventually placed a spoon on top to stop the rolling. After their bath is done (2-3 minutes), place them on a paper towel lined plate to cool. Wait until the nuggets are completely cooled before taking out the toothpick (another lesson learned). The finished nuggets turned out great! The kids must have thought so too, because they literally ate an entire plate full for dinner along with some fries. I can see them requesting Corn Dog Nuggets a lot in the future. 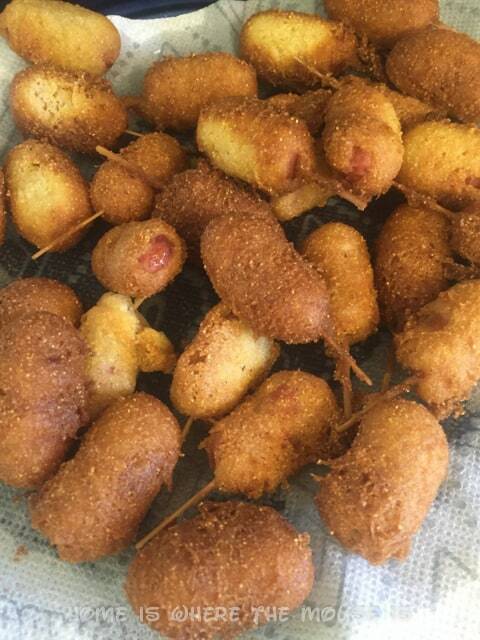 Satisfy your craving for Casey’s Corner Corn Dog Nuggets by making this easy copycat recipe at home. Heat oil in a dutch oven until it reaches a temperature of 350 degrees. If you don’t have an oil thermometer, wait until the oil ripples or a piece of bread can bubble at the surface. Prepare the box corn muffin mix according to the package directions. 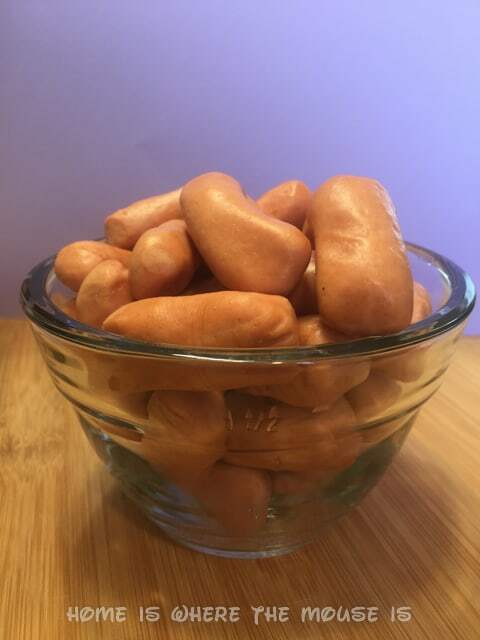 Dredge the mini hot dogs in flour. Insert a toothpick into each hot dog. 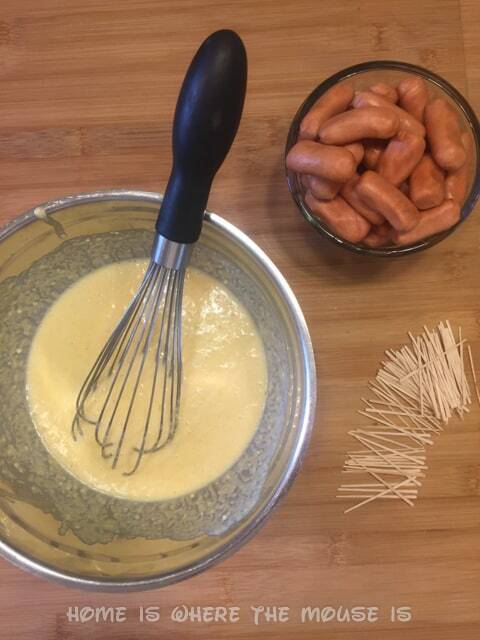 Dip each hot dog into the corn muffin mix and cover completely. Drop the corn muffin covered hot dog into the oil carefully, making sure it doesn’t stick to the bottom. Roll the hot dogs around during frying to make sure they are golden all over. Fry 2-3 minutes. Using a slotted spoon, take out the finished hot dogs and place them on a paper towel lined plate to cool. Once the hot dogs are cooled completely, take out the toothpicks. Serve with a side of mustard or ketchup. Enjoy! They look and sound amazing. I will have to try them. 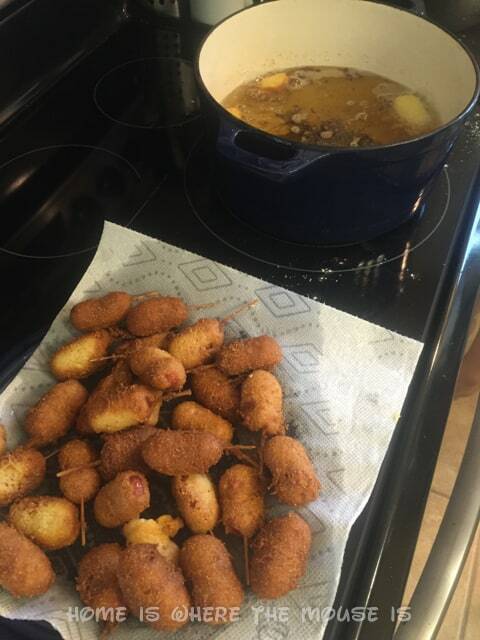 My son LOVES corn dog nuggets and the faker baker part works well for this mom who doesn’t do much cooking (or baking). Delicious! This is the perfect recipe for summer BBQs for the kids. Thanks for sharing this. Oh yum! I need to try making these. My kids would gobble them up I am sure. I also am a faker baker…so I would totally do the box mix as well. Thanks for sharing! These are a favorite of my boys so they’ll be excited to give them a try at home between trips! This looks like a ‘when Dad is away’ dinner that would have me ranked as ‘super mom’. The boys would love this especially with the dipping sauce.